The Australian dollar tried to move to higher ground but collapsed after climbing above 0.78. Rising US yields boosted the greenback and the A$ could not match it. Will we see further falls? 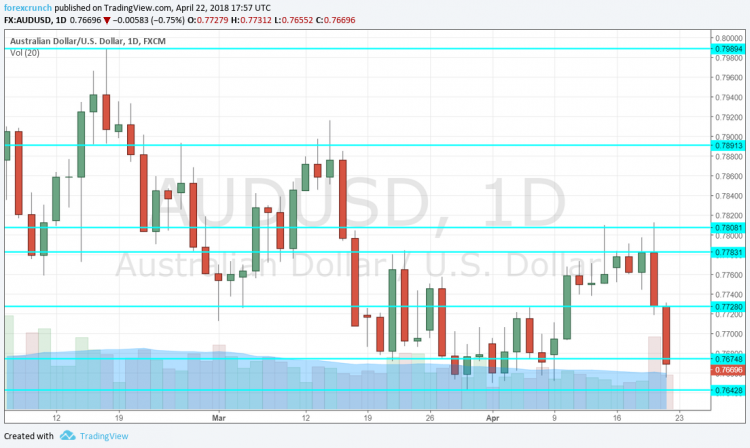 Here are the highlights of the week and an updated technical analysis for AUD/USD. The prices of aluminum and other metals shot up, helping the Australian dollar, a commodity currency. However, these rises were partly the result of trade tensions which then weighed on the currency. Moreover, rising US yields, based on upbeat economic data and optimistic messages from the Fed sent the USD higher, causing a sharp turnaround. CB Leading Index: Monday, 14:30. The Conference Board’s composite measure of the economy, based on 7 indicators, slipped by 0.1% in January. We may see a bounce now. Christopher Kent talks: Monday, 22:00. The Assistant Governor of the RBA speaks at an event in Sydney and may already know the inflation data that is published later. In any case, Kent may shed some light on where rates will go after the central bank exits its neutral mode. Australian inflation: Tuesday, 1:30. Australia releases its inflation figures only once per quarter, making each publication a bigger deal than in other countries. In the last quarter of 2017, headline inflation rose by 0.6% q/q, a solid and stable rate. The Trimmed Mean CPI (known as Core CPI in other countries) increased by 0.4%. The figures for Q1 2018 are expected to be 0.5% on the headline and also 0.5% on the core. Import Prices: Thursday, 1:30. Prices of imports feed into consumer prices. In Q4 2017, they jumped by 2%. A slower rise of 1.3% is on the cards now. PPI:Friday, 1:30. The Producer Price Index used to have a broader impact when it was published before the CPI number. Nevertheless, it still provides an insight about inflation in the pipeline. After an increase of 0.6%, a slower rise of 0.4% is on the cards.